If you need to brush up a little on the events that unfolded during the 2008 Minnesota Senate recount between Al Franken and Norm Coleman, take a look at this awesome timeline. Oh the Lizard People, do you remember that ballot? I do. The recount was the kind of thing political junkies ate up, filled with drama and intrigue and well, lizard people. 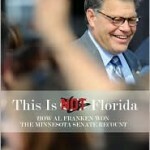 That timeline will whet your appetite for This Is Not Florida: How Al Franken Won the Minnesota Senate Recount, Jay Weiner’s book about the historic recount. Jay, a reporter, covered the recount MinnPost.com. Jay will be reading at 7 p.m. tomorrow (October 14) at Micawber’s, 2238 Carter Ave St. Paul and at 4 p.m. October 21, at the U of M Bookstore. Today, he’s answering the six questions we always ask. I have three books on my bedside table. One is my own. I'm rereading it to prepare for the onslaught of questions from reporters who want to trip me up! Everything Is Illuminated by Jonathan Safran Foer and Nixonland by Rick Pearlstein are also there. Everything Is Illuminated is the book my book club is reading this month. It's a couples book club. My wife, Ann Juergens, and I saw the movie and suggested the book. I did a little roots tracing in Poland two years ago, and this book is a quirky roots search. As for Nixonland, I'm working on another book project ? my personal magnum opus about the 1970s and some personal experiences. A friend told me Nixonland would get me immersed in the period. You know, not really. I've got to admit, ever since I was a kid I was more of a non-fiction reader. In a shocking development, I became a journalist. I should be a bit more literary than I am. But deep down I'm a sports writer. And I've never been big with crushes in real life, either. I'll go with John Steinbeck. That's an easy, non-controversial choice. He was a horrible smoker, so I don't know if he could handle our non-smoking laws. (I'm all for them.) I drink Beefeater martinis. I'd go to the Lexington ? which makes solid martinis ? or The Muddy Pig. I'd bring along Todd Orjala of the University of Minnesota Press, too. Todd likes the beers at The Muddy Pig. Like really, really first? Stone Soup. I was in kindergarten or first grade. I remember reading it over and over again. Some soldiers cook a soup, with a stone as the first ingredient, but other folks keep adding other edible stuff. Read it constantly. When I got older and visited my mother ? who recently died – she always joked, wondering if I was still reading Stone Soup. I know I bought a republished version for our sons. Great book for times of scarcity and for teaching trickery and cooperation all at the same time. Still a favorite. Is this a trick question? How couldn't you pick Fahrenheit 451? Wouldn’t it be THE book to preserve? It would tell the story of its survival and teach the next generation about the violence and fascism of book burning and censorship. But, because you asked, as it turns out, Ray Bradbury was my brother's first and all-time favorite author. When I was a college freshman and my brother a recent college grad, we drove from Philadelphia to California. I visited some folks in San Francisco, but Eddie got an audience with Bradbury in L.A. The man was genuinely nice to him. If we're going to keep one book, let's make it a Bradbury book. I guess it's War and Peace, only because I've heard it takes a lifetime to read and feels like a real big-boy book, the sort to impress people in turtlenecks in a coffee shop. I also have an inkling to read Bruce Catton's three-volume Centennial history of the Civil War. I'm dumb about a lot of stuff, but would love to be an expert on the Civil War. Sadly, I fear I will be checking my emails too often in my latter years to read either Tolstoy or Catton. But you can always hope. My favorite question is always the Fahrenheit 451 one, and I think this answer is my favorite I’ve read thus far! I’m probably supposed to be impartial. But I really loved that answer too.